These are the speeches given by the many presidents who passionately spoke regarding their support of the Declaration of Peace and Cessation of War (DPCW) and some of the important methods for its adoption to the UN at the 2018 HWPL World Peace Summit. Your Excellencies, Distinguished Guests, Ladies and Gentlemen, the “Declaration of Peace and Cessation of War‟ could not have come at a better time than this. Let me take this opportunity to thank Chairman Man Hee Lee for this brilliant, timely and history making initiative. The world will always remain grateful. Thank you Sir. Your Excellencies, for this declaration to leave its footprints on the sands of time, make a positive difference in the lives of ordinary people, take hope where there is despair, promote love where there is hate, it has to be owned and led by national and local actors in every country across the world. A bottom-up approach has to be employed to get states and their citizens buy into, own and lead the process. To ensure this, a set of people committed to global peace and security have to be mobilized to constructively engage members states in ensuring that this declaration is adopted by the United Nations. However, the essence of this declaration should not be limited to its adoption by the UN but rather to help transform mind-sets and change the conversations and narratives around global peace and security. 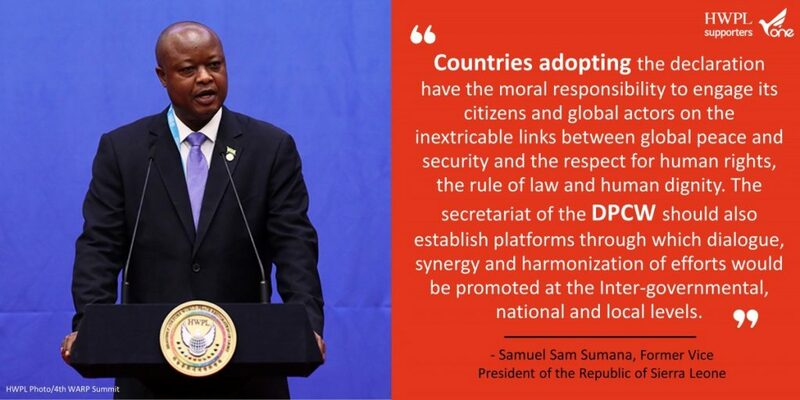 Countries adopting the declaration have the moral responsibility to engage its citizens and global actors on the inextricable links between global peace and security and the respect for human rights, the rule of law and human dignity. The secretariat of the DPCW should also establish platforms through which dialogue, synergy and harmonization of efforts would be promoted at the Inter-governmental, national and local levels. What I have realised is that it’s usually only people who have lived through the horrors of war who earnestly desire peace. These words by the former president of Sierra Leone are testament to this. The world is crying out for HWPL’s work. I hope the DPCW ocan be enacted at the United Nations as quickly as possible.